203k Streamline Loan from 1st Eagle Mortgage, Inc. In the past, one bought a home and then applied for a home equity loan to fund repairs and renovations, resulting in two loans. Many lenders won’t make rehab loans, and some won’t fund equity loans at closing, especially if there is no equity. 1st Eagle Mortgage, Inc. experts will work with you to obtain a 203k Streamline Loan. What are the advantages of a 203k Streamline Loan? A Streamlined 203K loan is figured into the original loan balance, resulting in one loan. It can be an adjustable-rate or fixed-rate mortgage . The mortgage balance can exceed the purchase price of the property. Borrowers are not required to hire professional consultants, licensed engineers or architects. The appraiser or home inspector can put together a list of recommended repairs / improvements. No minimum loan balance required. Borrowers must occupy the property. Property cannot be vacant for more than 30 days. Work must be completed within six months. If job requires a permit, borrowers must get a permit and a sign-off. Work must commence within 30 days from closing. Borrowers can select among licensed contractors. The lender will review the contractor’s experience, background and referrals. The lender will want a copy of the contractor’s estimate and the agreement between the contractor and borrower. Borrowers can also arrange to do some or all of the work under a “self help” arrangement. 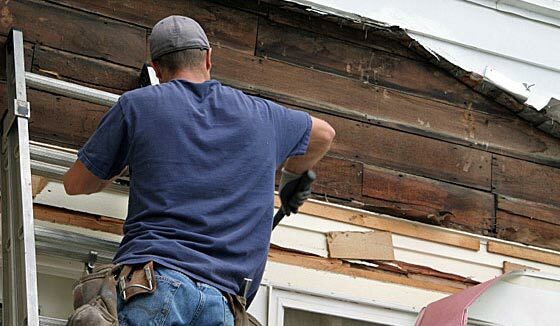 Do-it-yourself projects require providing the lender with documentation supporting the borrower’s knowledge, experience and ability to perform the necessary work. Maximum of two payments to each contractor, including the borrower, provided the borrower works under a “self help” plan. No more than a 50% advance is allowed. Do-it-yourself allowances do not include labor; only materials costs are allowed. Final payment is paid after submission of evidence of payment to sub-contractors / suppliers or other possible lien claimants. The lender is not required to inspect the completed work. The lender is not required to authorize a third party to inspect the completed work. A letter from the borrower or copies of contractor receipts will suffice as notice of completion, providing the lender has no reason to determine a third-party inspection is necessary. Please contact our office at 847.441.4116 with any questions and to begin the application process. Email us at: homeloans@1steaglemortgage.com.